Great jiu jitsu movie, RED BELT. I highly recommend it. See the trailer. http://www.youtube.com/watch?v=_LlkIRIQeuc&ob=av3e The conclusion, you could interpret in different ways. For me, the message is that there are things more important than money. Learning and teaching Jiu Jitsu is important that it is done in a traditional way even if it causes a personal sacrifice. RED BELTs are preservers of the tradition. Hopefully, seven generations from now, if you went to a jiu jitsu school, it should be similar to what we learn today. This week, I watched The Valente Brother’s, Pedro Jr. and Joaquin, on Desperita America! See link is http://www.graciemiami.com/media_center/featured_news/valente_brothers_on_telemundo_and_univison_. Professor Pedro Jr. and Joaquin were great. I was proud of the professors and for our school. The thing that I found most impressive was our female student. Her technique and execution was truly amazing. Size and strength can be over come. Note, men and women classes are separate. This week we had the pre fight fundamental lesson, my favorite lesson. 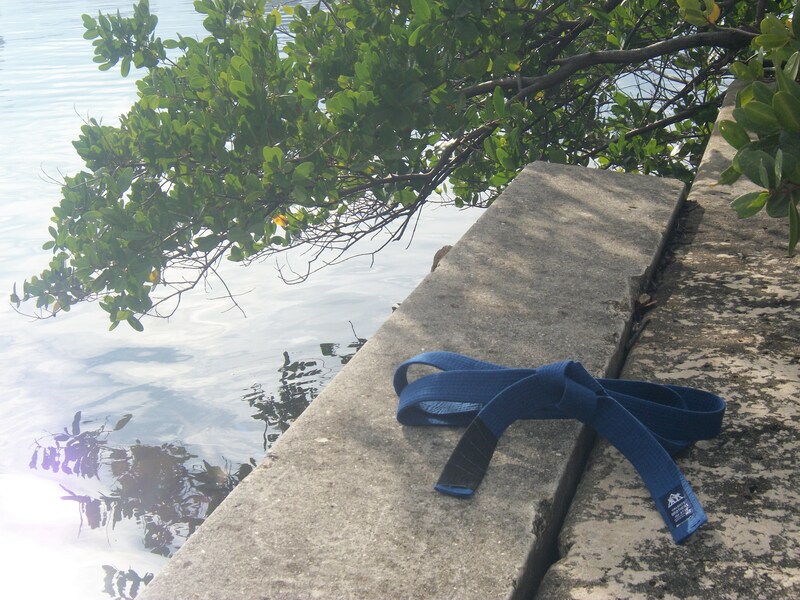 As black belt Phillipe said, ” There are a lot of ding dongs out there.” You have gotta be ready. I like this lesson because it has a throw in it, and more importantly, it’s the events that lead up to a fight. If you handle yourself well, it can result in a non fight. Most of the time, a few choice words and standing your ground, can make people wake up to the fact that a physical assault isn’t the way to go; especially, if it is over something minor like a parking spot, a non life threatening issue. A good way to be is to try to treat every person that approaches aggressively as a capable fighter so that you don’t get surprised attacked. For the first time, I tried a no kimono, no gi, class on Friday night. It was a tough group of people, an ex college wrestler, an ex m.m.a. fighter, and visitors, als0 known as, people off the street. Professor Gui taught us a few choke holds. These chokes are done when the opponent shrimps out of the side mount. That night I was lucky to have a brown belt as my partner whom was very patient and took me slowly through the steps. To be honest, I thought it was complicated and didn’t think that I would be using it anytime soon. However, I was wrong. I was able to do a guillotine choke when my opponent tried an elbow escape from the side mount. It was my first submission. Note, I don’t want to give the submission much attention just like when I tap out. For me what was extraordinary was that I was just taught the move, practiced the move on my partner, and then executed the move in sparring that night. That’s cool. Throwing is a part of Jiu Jitsu just as much as it is to Judo. I attempted the Makikomi. It was pretty bad. I was able to grab both elbows for a short while but I couldn’t swim my other arm over them to execute the throw. As soon as I grabbed both elbows of my opponent, he knew something was going to happen and immediately try to yank his arms free. What I learned is that the execution has to be quick or it won’t work. I was in some bad positions during sparring. At one point, my opponent had me in a top mount position with his full body weight on my abdomen and the hooks in. I was having trouble breathing. I panicked. I should have stuck it out because I was prepared for this. I have been practicing a five-minute meditation on only five breathes. Here’s how you do it. It is a twenty-second inhale, hold for twenty seconds, and exhale for twenty. Five breathes, five minutes. Note, it takes practice to get a twenty-second inhale. You can start with a 10 second inhale, 10 second breath hold, and 10 second exhale. At another time, I was pinned. I tried a pressure point to get my opponent to let go. It didn’t work but it may have made him uncomfortable. I should have asked my opponent after the match if it was working. Note to self, research pressure points. If I find any article worth mentioning , I will let you all know. Every Friday Night after the fundamental class, Professor Pedro talks about Jiu Jitsu philosophy and life style. I forgot about this. I usually have prepared questions. If any of you have a question, please on forward it. Anyways, someone asked about the Gracie Diet. I haven’t read the book yet. I haven’t really started the diet. From what I understood, the diet is concerned with blood ph levels. It is bad to have high acidity in the blood. The blood should be alkaline. To keep your blood alkaline, you have to consume the right food and not mix certain foods. Professor Pedro also discussed taking control of your mind as with his example of salt addiction. He made the decision to never put salt on his food. We all know that long-term over use of salt leads to high blood pressure. Once you stop over consuming salt, it takes around three months before the taste of the food returns. Back in the late 1990s, my ex girlfriend from Liverpool, England, taught me that we put too much salt in our food in America. That night, she made a soup without salt to prove her point. The food wasn’t important. It was a salt addiction and the food could have been anything. I liked Professor Pedro’s message of how he instructed his mind that he isn’t going to consume salt instead of his mind instructing him to eat salt. A part of a Jiu Jitsu practitioner’s goal is to learn mind control so that we can control our emotions. On Sunday, I injuried my lower back trying to do a crazy exercise of hopping up four flights of stairs. I got the idea from a show that I recently saw. First mistake was that I should have stretched out. Well, on last step, I felt severe pain in the lower back. Odd. So when I arrived home, I put on myoflex anti pain cream and then applied a bag of frozen peas. I don’t like pills. I try to stay away from pills due to side effects. Later on, I did a back stretch but it just added more pain. Anyways, this got me thinking about a book I read a few months ago called Training Camp. It had an interesting theme of sports competition and sports injury; apparently, they go hand in hand. Every sports athlete has to deal with injury. The champion player handles their pain and injury so that they come back for each game day. Champion players bounce back faster than average players. They know how to heal themselves quickly, and how to avoid on field dangers. Also, they have a mind-set of staying in the game by working through the pain, they get taped up, and go back in. Note, I’m not writing about life threating injury from game play or something that would warrant staying out of it. As Jiu Jitsu players, we are going to face getting injuries from time to time. So, this week, I avoided the throwing class and the sparring but I did go to the fundamental classes since it is a lower impact. I will be healed and ready for a full play next week. It took a lot of positive self talk to get me to sparring this week. I totally didn’t want to do it but that is the time I needed to go. As I waited for my name to be called, I felt like a bloody steak just about to be tossed into an alligator pit. I had four opponents, one American, one Brazillian, one Colombian, and one Russian. I received the most damage from the Russian, but I also learned the most from him. My body is all messed up. I will be ready for next week. I gave up my back at least eight times. This is not sports Jiu Jitsu, so giving up your back is the end of the fight. I tapped out at least five times. I did a few things right, I didn’t burnout. I had conserved my energy throughout all my matches. I didnt get overly aggressive and I remained calm under the pressure. I did a new take down,kukkiki toashi. I think thats the name. So, my goal for next week is to try to not give up my back as much. Work a new throw.